From Hell and High Water by Rebecca Theim, © 2013, used by permission of the publisher, Pelican Publishing Company, Inc. The Plain Dealer's campaign included half-page ads in the newspaper, bus placards, and YouTube video spots featuring union members and Cleveland celebrities alike (actress Valerie Bertinelli from the TV show Hot in Cleveland was one), emphasizing the importance of a daily newspaper and lobbying for its preservation. "We're trying to get out ahead of this thing and give people a stake and a say in what happens," John Mangels, the leader of the guild committee that created the marketing campaign, told the Plain Dealer in early November 2012. "It really ought to be the community's fight as well as ours." Advance's target in Cleveland, however, appeared to be less the daily print newspaper, and more the newsroom's union. In a deal reached in late 2012 between the Guild and Advance, the union accepted a workforce reduction of fifty-eight employees in exchange for a guarantee of no further large-scale layoffs through 2019. Without the agreement, Advance warned it would purge eighty to eighty-five Plain Dealer employees when the current contract expired in a few months, and also would likely begin docking employees' wages for a portion of health insurance premiums now covered by the company. The new contract instead protects most existing Guild members, restores the 8-percent wage cut they had taken to avoid layoffs in 2009, and provides for Advance to shore up their underfunded pension and health care funds. Although potentially devastating for the roughly sixty employees who have or will ultimately lose their jobs, the union contract looked surprisingly generous on the part of Advance—until one looked at the fine print. 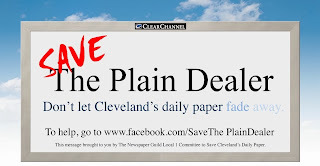 Previously, work by non-union Cleveland.com journalists was prohibited from appearing in the pages of the Plain Dealer, while Plain Dealer reporters' work appeared both in the newspaper and on Cleveland.com, an arrangement that assured the union local would be supplied with new members as long as a print newspaper existed. That, however, changed under the new contract, with online reporters' work now also being allowed into the pages of the newspaper. "It's a major concession by the Newspaper Guild, and it'll weaken the union over time, since new hires will likely be on the online side," Cleveland Magazine senior editor Erick Trickey wrote on the publication's blog. The change will result in a "shrinking unionized newsroom and a new, non-union digital news staff." The union acknowledged as such. "A big part of that is we've given them some language that could, over the years, really diminish our numbers," Guild chairman Harlan Spector told Poynter.org. "That was probably the biggest and hardest thing we gave up, and it was a very contentious point," the Guild's administrative officer, Rollie Dreussi, recalled in a May 2013 interview with me. "We understand what it could mean in the long run, but no one knows for sure how it will work out. Sometimes you have to do what you can to stay in the battle just to keep fighting the war." The symbolism of Advance's checkmate also probably resonated with its historically anti-union owners. The "1" in "Local 1," after all, represents the first. An early predecessor of the Plain Dealer was "the birthplace of the [country's Newspaper] Guild," on March 20, 1934. After the fifty-odd layoffs that occurred the final day of July 2013, the newsroom stood at 110 employees, down from 350 a decade ago. In earlier negotiations for the union contract now in force, the newspaper guaranteed that only five more employees would lose their jobs in the subsequent six years. Union members have suggested that their campaign may have saved its daily newspaper status. It, like the Post-Standard and the Oregonian, is printed daily, but home-delivered only four days a week, as of August 5, 2013. If contentions by the Plain Dealer union were true, the day's events did seem to further demonstrate that the Guild itself was a target as much as any employee. By the time the specific cuts were announced, about two dozen newsroom employees already had voluntarily left the newspaper, Cleveland.com reported, which the union assumed meant that fewer than the previously agreed-to fifty-eight would face the chopping block. 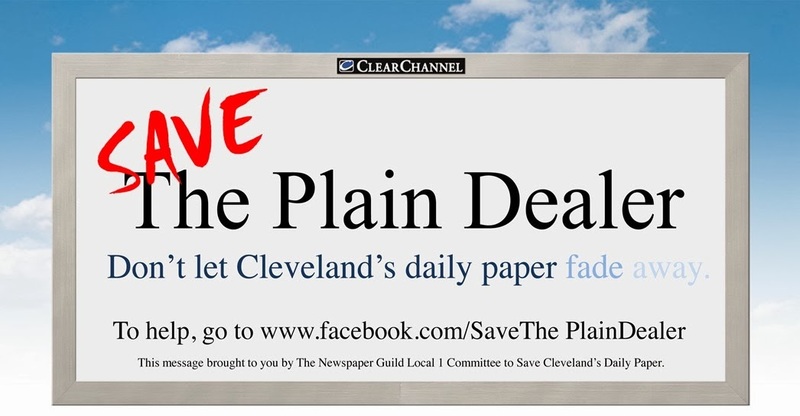 Guild President Spector and "Save the Plain Dealer" Leader Mangels both volunteered for layoffs, in an attempt to spare others, and at least a half-dozen other employees also voluntarily left the newspaper (in addition to the earlier departures that occurred in the months since the news of the coming cutbacks first broke). However, the Guild cried foul, saying the company reneged on the original agreement to first extend offers to any employees it wanted to hire at Cleveland.com and count those "transfers" against the original number of mutually agreed upon layoffs. The company instead distributed its telephonic pink slips and plans to extend employment offers at Cleveland.com later, meaning that any departures of survivors who choose to leave the Plain Dealer in favor of Cleveland.com will further reduce the ranks of unionized employees at the company. For its part, the company insisted that it had bargained with the Guild in good faith. "This has been our practice in the past and we will continue to do the same in the future," publisher and president Terrance Eggers said in a statement reported on Cleveland.com. Another twenty employees lost their jobs at the Sun News, a chain of eleven Advance-owned weekly newspapers circulating in the Cleveland suburbs. "Will the last journalist out of the newspaper business please turn off the lights?" one tweet asked. By the middle of September 2013, "digital first" would claim about 1,600 jobs at Advance newspapers from Portland, Oregon, to Mobile, Alabama. The day the details of the changes and the resulting layoffs were spelled out for Advance employees in New Orleans and Alabama, Steven Newhouse, chairman of Advance.net and presumed arbiter, if not mastermind, behind the company's digital-first strategy, gave a rare interview to a publication not owned by Advance. Most of his reported conversation with Campbell Robertson, the New York Times's New Orleans-based Southern correspondent, was unremarkable, but one thing Newhouse said about the Times- Picayune raised the ire of just about every New Orleanian who read or heard it: "We have no intention of selling, no matter how much noise there is out there." Although stunning in its insensitivity, Steven Newhouse's pronouncement confirmed the type of relationship the secretive and tight-knit Newhouse family was seen to have with its nearly three dozen newspapers spanning both coasts: a seemingly contradictory combination of laissez faire management that generally deferred to the sensibilities and predilections of local publishers and their perceptions of the community, but a stance that also could enforce a corporate overlord mentality on major, and usually controversial, issues—or as a 1992 New York Times headline described it, "Newhouse Maintains Loose Reins with a Tight Grip." It also perhaps revealed a shift in how the third, and latest generation, of the Newhouse family viewed and expected to conduct business with the Times-Picayune, and by extension, its other newspapers. Advance had owned the Times-Picayune just a few months short of fifty years at the time of Steven Newhouse's proclamation, and the utterance was a slap in the face to New Orleanians who cared deeply about their daily newspaper. "Hello? Steve Newhouse? It's WTF calling," was the headline on a column appearing on NolaVie, the nonprofit lifestyle and culture website that shares select content for posting on NOLA.com. "That was the eulogy Steven Newhouse read at Tuesday's funeral for our beloved Times-Picayune," columnist Brett Will Taylor wrote. "Only he didn't deliver it in person. He read it over the phone. To the New York Times. Which leads me to ask all of us mourners, we family members of the dearly departed, the following question: What. The. F%*#?" "Noise?" Is that what he thinks New Orleanians have been pouring out from their hearts? What Mr. Newhouse calls "noise," we recognize as the voices of our friends and neighbors. When a billionaire absentee owner refers to the heartfelt pleas of his customers as "noise," it tells us that all the pretty puffery about a more "robust" news product is pure bunk. Local business owners, many of whom for years have faithfully advertised in Mr. Newhouse's paper, know all too well that ignoring the voices of customers—particularly in New Orleans—is a recipe for failure. Oddly enough, we suspect that's the Newhouse plan: sooner rather than later, there will be no printed edition of the Times-Picayune. Steven Newhouse later in the summer backpedaled from the harshness of his remark and some of the tactics that had been employed by Advance newspapers as they implemented "digital-first." "Some of the criticism was well founded," he wrote in the August 2012 commentary on Poynter.org, about the outrage and negative media coverage that greeted the company's "forced march to digital," as newspaper analyst Ken Doctor coined it. "We could have communicated our decisions more openly and sensitively to our employees, our readers and our communities." It nonetheless is almost impossible to imagine Steven Newhouse's father, Donald, the family member who has overseen Advance's three-dozen-odd daily and weekly newspapers for roughly six decades, making such a tone-deaf public comment about any of the company's properties. Although he had infrequent direct contact with the rank-and-file, Times-Picayune employees had for years spotted the elder Newhouse at the newspaper's downtown headquarters during his regular business updates with Ashton Phelps, Sr. and Jr. Many Newhouse relatives and Advance executives had trained or worked at the newspaper over the years, including the younger Newhouse brother, the late Norman Newhouse, and the family's support of the newspaper following Katrina had strengthened employees' gratitude to the family. Advance, however, had been operating for close to a decade in a very different era than it did in the heyday of the media empire amassed by Steven's grandfather and Donald's father, S.I. "Sam" Newhouse Sr. During the newspaper industry's financial zenith that began in the late 1970s and extended through the middle of the first decade of the new millennium, publishers almost printed money along with their newspapers, and few were better at it than Sam Newhouse. "It used to be that running a newspaper was slam-dunk easy. It was a beautiful business to be in," said Alan Mutter, a former newspaper reporter, editor, and columnist turned industry analyst and consultant who bills himself as "perhaps the only CEO in Silicon Valley who knows how to set type one letter at a time." "You were the only one in town, you could raise rates at will any time you needed to, and back in the day, people didn't have a choice. You needed to hire a secretary? You took out a [help wanted] ad in the [local] newspaper for $600 because there wasn't another option. Monster.com or Craigslist didn't exist. Now, the newspaper business is anything but easy. It's incredibly complicated. It has gone from being stupid easy to being almost unbearably difficult." Newhouse newspapers, before the full-bore arrival of the Internet as an information and entertainment medium, routinely enjoyed profit margins among the best in the industry—between 20 percent and 30 percent, leading newspaper analysts John Morton and Ken Doctor estimated. Morton projected that Advance's profit margin is now probably half of what it was at its apex, while Doctor said the company's newspapers probably would fetch 10 percent of what they would have a decade ago. Because Advance is a privately held company—and a secretive one at that—it is essentially impossible to obtain financial information that provides meaningful insight into its performance. While the company and the Times-Picayune released limited financial data after public sentiment developed so forcefully against them, it has by-and-large been cherry-picked information that supports their narrative or a particular position they are trying to advance. For example, NOLA Media Group president and publisher Ricky Mathews told the Wall Street Journal in the fall of 2012 that NOLA.com's online revenue grew 20 percent year over year, but he wouldn't say from what base, making it impossible to assess the website's relative performance, or evaluate it against industry standards. Even when executives do release figures, they don't always match up. In a January 2013 commentary published on NOLA.com that assessed NOLA Media Group's performance since the change, Times-Picayune editor Jim Amoss wrote that, "In 2012, 41 million viewers came to NOLA.com, 7 million more viewers than in 2011." "Viewers" is not a recognized industry metric, so in writing about the commentary for CJR, the magazine's "Audit" editor Ryan Chittum presumed Amoss was referring to unique visitors. Amoss' numbers averaged 3.4 million unique visitors a month in 2012, and 2.83 million in 2011. However, Mathews and Amoss presented numbers to an industry conference in New Orleans some six weeks later that were significantly larger than the figures Amoss cited in his commentary. In a comprehensive story published by Columbia Journalism Review in March 2013 about the Times-Picayune since it became a less-than-daily publication, the magazine estimated that the newspaper and NOLA.com annually generate roughly $90 million in revenue and $9 million in operating profit, "which come overwhelmingly from the print side." In a report he wrote for the Nation that cited both publicly available and proprietary figures shared by employees, New Orleans author and freelance investigative journalist Jason Berry concluded that the newspaper probably made about $8 million in 2011. CJR estimated the Times-Picayune's circulation revenue at roughly $25 million to $30 million annually, which, if true, meant the print newspaper generated more than 90 percent of the company's revenue before the changes "and still likely brings in five of every six dollars in revenue," CJR concluded. "If NOLA Media Group were a standalone business with no newspaper to support it, its costs would exceed its revenue by many times." As mentioned earlier, global market research company Kantar Media projected that the Times-Picayune brought in $64.7 million in print advertising revenue in 2011, while NOLA.com earned less than one-tenth of that, or $5.7 million. Given that the Times-Picayune has publicly acknowledged that it was still profitable before the changes were implemented, the situation is likely no better, and potentially far worse, at other Advance newspapers. For example, New York Magazine in 2009 reported that the company's largest newspaper, New Jersey's Newark Star-Ledger, may have lost as much as $40 million in 2008. The newspaper will lose a projected $51.6 million in 2011- 13, publisher Richard Vezza disclosed in June 2013, a figure the newspaper's three labor unions flatly reject. Mobile, Alabama's Press-Register—earlier nicknamed the "Cash Register" in journalism and Mobile business circles because of its reported historically high levels of profitability—saw its profits sink from $7.3 million in 2006, to about $4 million in 2007, and $313,000 in 2008, before its 2009 budget projected a loss of $200,000, according to information presented in the lawsuit former Press- Register publisher Howard Bronson brought against the newspaper and Advance in 2009. "No one in the [Newhouse] family believes the newspaper business is coming back," New York Magazine reported in 2009. Regardless of the continued day-to-day involvement of octogenarians Si and Donald Newhouse, it's clear they have begun to pass the mantle to younger Newhouse family members. The third generation not only must manage the radical shift in the very underpinnings of the family business, but they also are likely intent on defying that traditional "third-generation jinx" that fells so many previously successful family-owned enterprises. Front and center is Steven Newhouse, labeled in 2012 by the New York Observer as "the third-gen Newhouse to watch," who, with the changes at the Times-Picayune and other Advance newspapers "has proven himself a savvy businessman who little relishes underwriting a failing business model." An unlikely defender of Steven Newhouse is Dan Shea, one of the Times-Picayune's two former co-managing editors who was unceremoniously forced out by the 2012 layoffs, and has since been hired as chief operating officer and general manager of the Advocate by its new owner, New Orleans businessman John Georges. "When I see people condemning [the Newhouses] and saying that they're doing this just because they're greedy, I don't think that's the case," Shea said in March 2013, six weeks before landing the job with the Advocate. "Steve Newhouse doesn't want to be the generation that runs this off the rails. I don't ascribe evil motives to it. People don't understand business and the serious role Steven Newhouse has in preserving his family's fortune." But Steven, his two siblings, and their cousins have limited options, given the company's overwhelmingly "legacy media" assets in today's increasingly digital media world. "They're saddled with the legacy, and they're a prisoner of that legacy," Mutter observed. "They got caught when the music stopped. The value of their newspaper assets is shrinking, and they long ago missed the opportunity to get out while the getting was good." Although Donald and Steven Newhouse have been adamant that their company will not sell the Times-Picayune, Mutter's observation points to the reality that the Newhouses' intransigence may very well represent less of an unwillingness to sell, and more of an unwillingness to sell at the price their newspapers would fetch in today's market. The third generation of Newhouses are "pissed because they didn't sell when they should have, they're pissed because they couldn't do anything about New Orleans after Katrina, and they're pissed now that they've got this rich guy [Georges]who's suddenly confronting them with a form of potentially asymmetrical warfare, a competitor who appears to have the assets and desire to do what it takes to be the dominant publisher in southern Louisiana," analyst Alan Mutter observed. "They're between a rock and hard place. They don't want to be the ones to turn off the lights at the newspapers. They don't want to be the ones who fail." But improved profitability via cost reduction is the real short-term goal, Doctor, Edmonds, Morton, Mutter, and others conclude. "All of this suggests that [Advance is] trying to maximize near-term profitability against the day when [daily newspapers are] no longer a viable business," Mutter said. "What can you do this month, and next month, and for the foreseeable future? You can control your expenses to maximize short-term profitability. The plan is to keep figuring out ways to make money, and the day they figure out that they can't make money anymore, they'll close it. On his "Reflections of a Newsosaur" blog, Mutter borrowed the term popularized in 2004's The Vanishing Newspaper: Saving Journalism in the Information Age by former newspaper editor and University of North Carolina at Chapel Hill professor emeritus Philip Meyer—the "Milk It" strategy: Accept the inevitable decline and fall of the traditional newspaper model and then whack costs to extract the most profits from the decaying business for as long as possible. As unfortunate as it may be that Ann Arbor, New Orleans or Mobile are deprived of the power of a vigorous press, the strategy evidently selected by Advance makes sense if you believe that the best days of newspapering are behind us. By cutting staff to a bare minimum and printing only on the days it is profitable to do so, publishers can milk considerable sums from their franchises until the day these once-indomitable cash cows go dry. Doctor predicts Advance will be more profitable in 2013 than it was in 2012, "but their print advertising is declining with everyone else's. The only way they maintain the newer, higher profit is to continue to cut expenses because they don't have increasing reader revenue. If they want 12 percent, or 15 percent profit, the only way to achieve that is to continue to cut. They will have to continue to cut content, and that's simply not a strategy."